The Constellations/Stars Illuminated Globe is 13cm in diameter and rotates on one axis. The globe provides two levels of detail, when unlit constellations can be seen, when illuminated stars are visible. 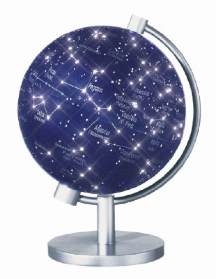 This globe shows the night sky in brilliant colour and is complete with 88 constellation names. It features a sturdy, silver coloured base and metal meridian. The globe height is 18.5cm and it comes in an eye-catching gift box with simple to follow instructions on replacing the bulb. The mains adaptor incorporates an on/off switch and detachable cord.